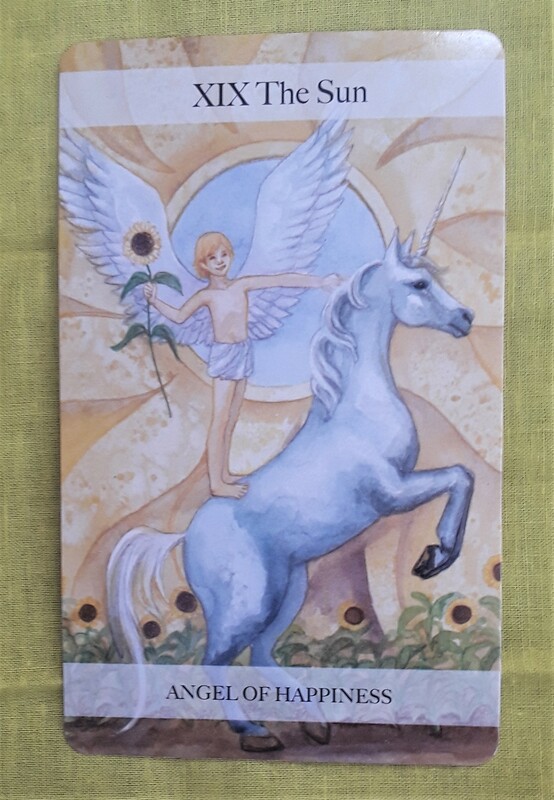 The Tarot cards for today are the Sun (Angel of Happiness) and the Fool (Angel of Innocence). What an awesome combination. As you wind up this busy week, get in the mood for relaxation. Greet the day with no expectations and don’t allow negative thoughts to stay in your mind for very long. Regardless of whatever is going on in your life, create your own peaceful space. Understand that you can come to this same space of happiness and bliss any time you want to. The Tarot cards for today are the Fool, Death, and the World. I think it’s remarkable that these cards came out together in that order, so I’m going to spend a little more time on this reading than usual. So bear with me! As you may know, the Tarot deck that I use (which is one of the most popular Tarot decks and has been around a long time) has 78 cards. Fifty-six of the cards are made up of the four suits (Wands, Pentacles, Swords, and Cups). As a group, these 56 cards are called the Minor Arcana. Generally speaking, the Minor Arcana represents things that happen during everyday life and temporary events. The other 22 cards as a group are called the Major Arcana. They are numbered from 0 to 21. In a reading, they usually point to major turning points in a person’s life or an important highlight. When the 22 cards in the Major Arcana are laid spread out one by one in numerical order, it is said to tell the story of the the Fool’s Journey. 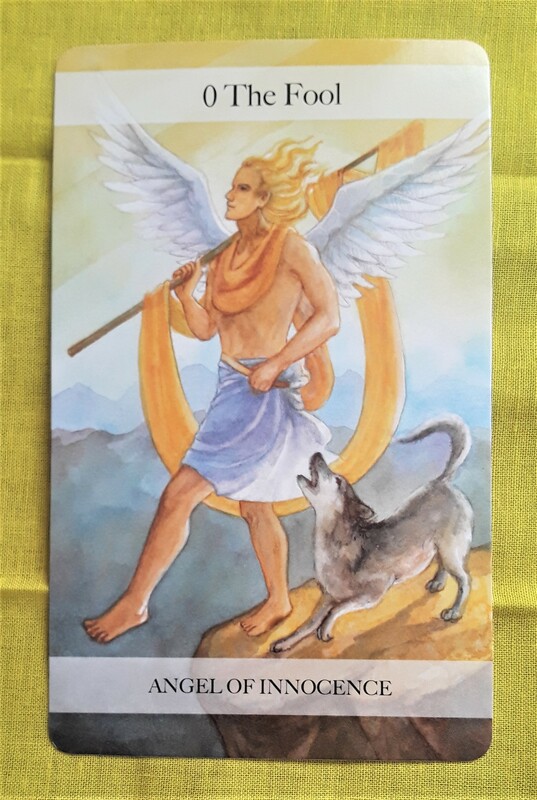 It starts with the 0 card (the innocent Fool) who begins his spiritual journey by learning how to use the four elements with the 1 card (the Magician), then learning how to rely on intuition with the 2 card (the High Priestess), then learning how to deal with raw masculine energy with the 3 card (the Emperor), and so on. In my mind, the three cards I pulled today is a perfect summary of the Fool’s Journey — starting at the beginning of the Major Arcana with card 0, the Fool, onward to the middle of the Major Arcana with card 13, Death (which is a symbol of transformation), and ending with the last card of the Major Arcana, card 21, the World (which symbolizes the successful completion of a major milestone). Astrologically speaking, we have been dealing with some potent energies this year, including lots of retrogrades and a powerful series of eclipses. Like the Fool, we could not know exactly how these energies would affect our lives, but we carried on. It is very likely that your life has changed in important ways this year, both outwardly and in the way you think and feel inside. 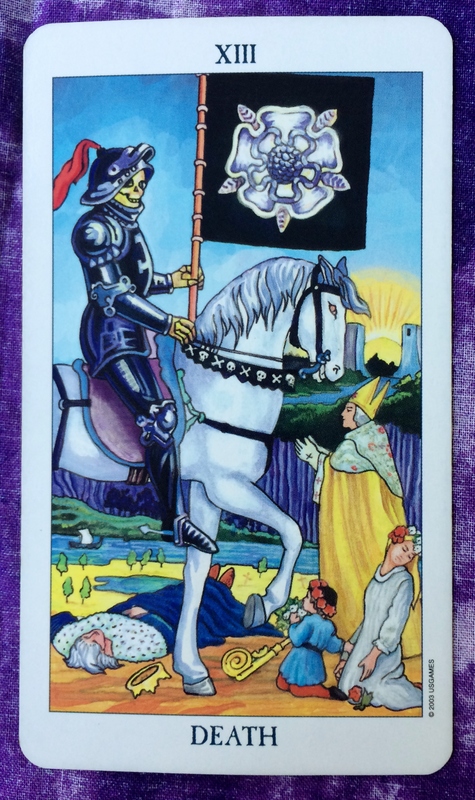 This is what the Death card represents — important change in your life. 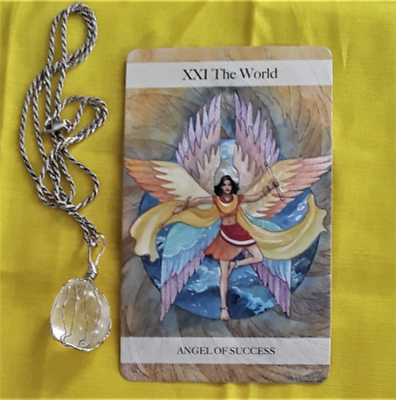 The World card suggests that you have come to understand what these changes mean and as a result, you are wiser. Even as you celebrate the completion of this cycle, know that the cycle always begins again. There is always something new to learn and aspects of ourselves to discover. Like peeling an onion, there is always another layer. 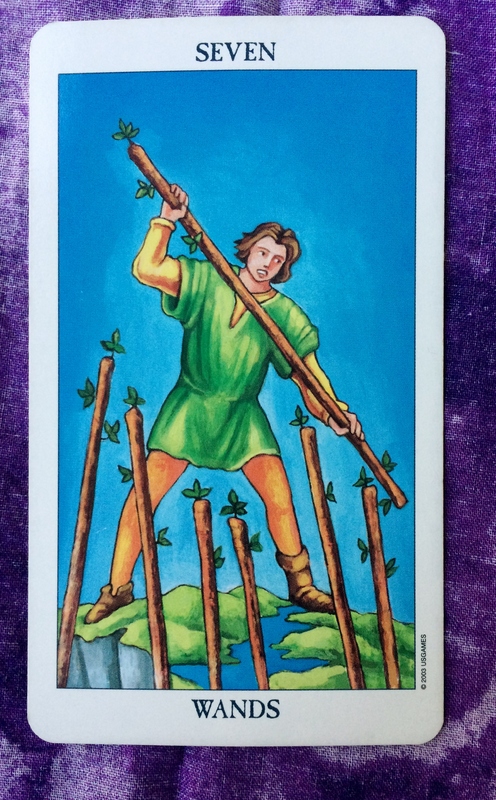 The Tarot cards for today are the Fool and the Seven of Swords. Last night’s new moon, as is true for all new moons, signals a time of new beginnings. 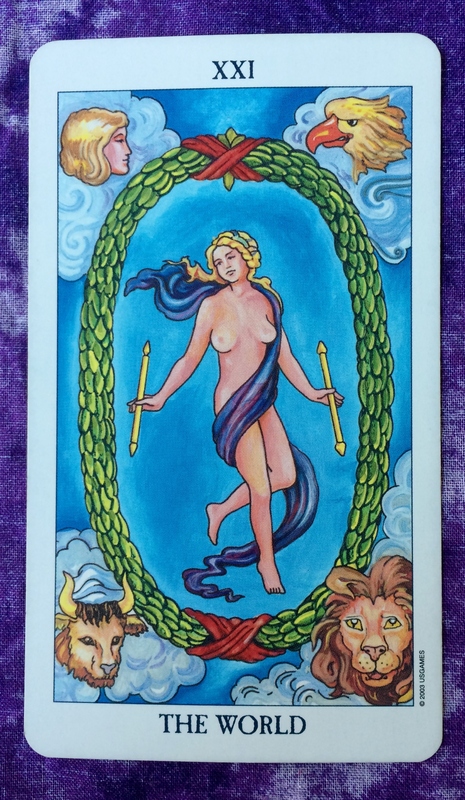 One of the best ways to approach new beginnings is to be like the character in the Fool card — that is, to have an open mind, to be optimistic, and to know that you are protected. New experiences further your growth as a person. 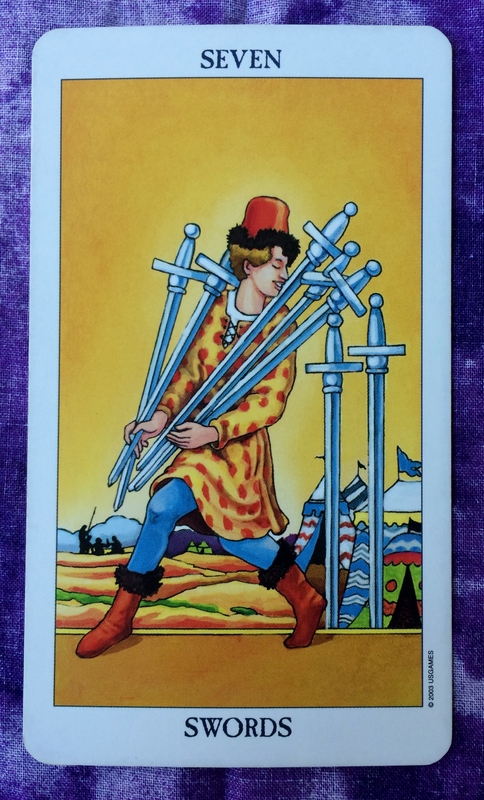 Unfortunately, as the Seven of Swords reminds us, not everyone is one the same path as you. Some people have ill intentions toward you and some people may not realize that their chaotic energy is a distraction in your life. Be aware of this dynamic, without judgment. Serve as an example to others of integrity by continuing to follow your bliss. As you go through your day, approach every situation with an open mind and no expectations. Don’t assume you know what is going to happen at any given moment. Don’t try to guess what other people are thinking. Turn off your bias against race, gender, age, body type, social status, etc. Don’t allow what happened a year ago, yesterday, or five minutes ago to influence what you do right now. Breathe each breath like it’s your first and your last. 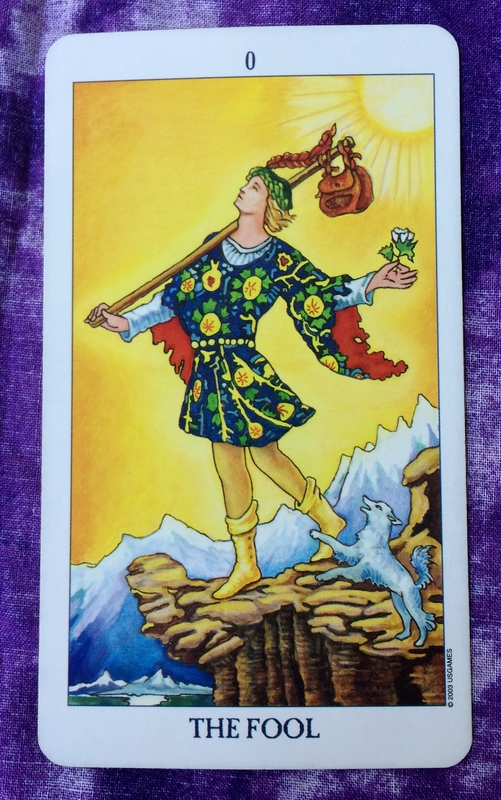 The Tarot card of the day is the Fool. In a nutshell, today is the first day of the rest of your life. Recognize the positive experiences you have had this week as signs that more happiness than you ever imagined is possible for you. Start fresh with this new outlook on life. Appreciate every blade of grass and every crack in the sidewalk. And when things do not seem to be going your way, know that you are being led to greater wisdom via the path of experience.